This is probably the finest scope made under 4", and more than likely beats many 4" APO's too. The optics are exquisite, and when seeing conditions permit I've had it up to 403x (yes, 403x) on Jupiter, Saturn, and Luna, with no image breakdown. Most nights from my house I can easily use 300x with this scope, so it basically eats magnification for breakfast. My scope shows no secondary spectrum at all on any object (including Venus), throughout the entire range of focus, at any magnification I can obtain with my current eyepiece collection. The deep-sky wide field performance is outstanding - 4* with a 31 Nagler, and 4.4* with a UO 40mm MK-70. Stars are pinpoint, and it resolves as much as a 92mm scope can by all laws of Physics. But the best part is the contrast - sky background is dead-black & many faint details are visible that might not be in other scopes of similar size. We pitted this against a TeleVue NP-101, and while the NP went slightly deeper & had a flatter field (which is what it's designed to have for imaging), the Stowaway did beat it for contrast. Contrast is key for visual observing so for visual use I'd rather have the Stowaway. I do not image at all, but I believe there is a field flattner availabe from AP for those that want to image with this scope. The scope is very lightweight (6 lbs.) and is easily transportable or used as a grab-n-go. The reason I gave it a 9 for ease of use is the fact that there is no provision for a finder. I realize the FOV is wide enough to use the scope itself in that capacity, but I don't like doing that, and most observers I've talked to don't observe that way either. For a $2800 OTA, how much problem could it have been to include that aspect? The owner is left with having to spend more money to modify the scope or rings to accomodate a finder, or having a completely new set of rings made that will accomplish this. Instead (after much hassle of trying to mount something else without ruining the originality of the scope) I wound up putting a Rigel Quickfinder on mine, and thankfully it works very well. The overall value is subjective to each individual. Keep in mind that even though it's superb, it's expensive even for an APO in this size range, and $3K can buy a very nice high quality 10" or 12.5" dob that will show you much more than a 92mm can. Having said that, I've never seen anything like it for it's size. This is the most perfect telescope I have ever owned. Planetary performance belies its small aperture. Star images are perfect with only the slightest hint of color on the brightest stars. Limiting magnitude is about 13.8 under dark skies. Very fine mechanics with a few minor quibbles (no provision for finder or for balancing tube without tools, dewcap needlessly short). I do not feel deprived when using this scope, even when larger scopes are nearby. Got mine Oct. 2002 superb optics better color correction over my TV85,I mean absolutely no color on bright objects like the moon you could say I got this scope by accident. At first what I really wanted was the Traveler called AP Sept. of 98 to put me in the waiting list had a good conversation with Marge of AP and she actuall invited me if i would be interested having my name in list the for the stoway,hey why not four years later got a call that they one ready to ship,at first I was dissappointed I really wanted a Traveler .But now I'd rather have this over the Traveler since its almost as portable as the TV85 but with a 7mm most aperture can't beat that with a stick. Excellent scope. Long waiting list. awesome wide views, clean , contrasty images,defies size, Nothing in size or aperture comes close. Better dim but sharp than bright and blurry. Exeptional scope, crisp, sharp images, perfect optics, not a trace of color. It loves to take on high power. Buttery smoth focucser!! Absolutely worth it. My observing scope and guide to my 130EDF. A giant killer(contrast)at star parties.The Ultimate portable. With Televue telecompressor,f:3.9 !! A real jewel. Jay O. Tiny, light-weight, airliner-portable, optically superb and PURE FUN! What a gem! A little scope that thinks it's a big scope. 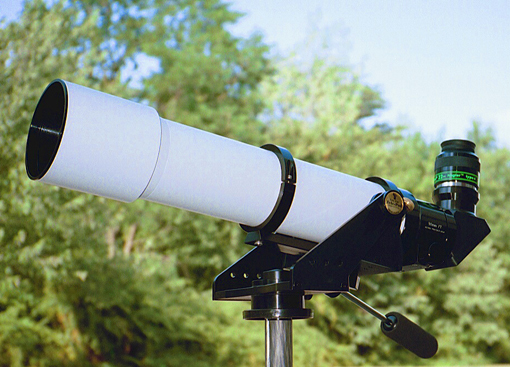 Probably the best small telescope in the world. I can not imagine there ever being a better one.